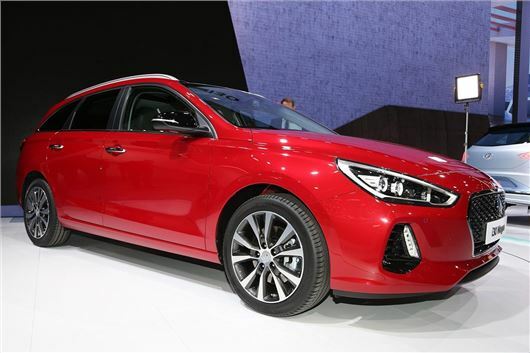 Hyundai has launched the all-new i30 Tourer at the 2017 2017 Geneva Motor Show. The estate version of the i30 hatch should reach showrooms by the end of the year with prices starting from £18,000. Like the hatchback, the i30 estate features an all-turbocharged engine line-up, with the petrols consisting of three-cylinder 1.0-litre engines offered alongside four-cylinder 1.4 units. The diesel range will feature the familiar 1.6-litre turbodiesel, which was found in the previous gen i30. Outputs vary from 95PS to 140PS. The new i30 Tourer provides more boot space than the old estate, with 602 litres when the rear seats are in place and 1650 litres with the seats folded. Previously the i30 Tourer offered 528/1642 litres. Hyundai is also promising its latest active safety tech too, with autonomous emergency braking, high beam assist and a lane keep system that will warn the driver if they sway into another motorway lane. Adaptive cruise control and rear-cross traffic alert will also be available, with the latter warning the driver of approaching traffic when reversing out of a narrow area, such as a driveway. As before, the i30 estate will be backed by Hyundai’s five-year unlimited mileage warranty.